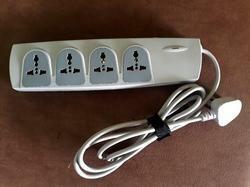 4 WAY UNIVERSAL POWER STRIP- CE Marked Cetification. Micromot Extension Cord 300 Cm. For all 12V machines. Plug and wall-socket reverse polarity- protected. 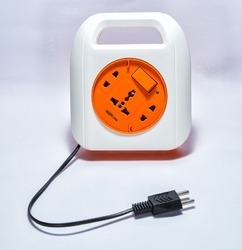 The 2 outlets of this power strip allow you to power multiple electrical devices with 2 pin plug and 3 pin socket at the same time with single controlling switch and a safety fuse. Rishi Kumar Gupta & Co.
With electricity playing a dominant role in our lives, electrical accessories not only define how smoothly and efficiently we function but also reflect our lifestyle and tastes. Displaying a consistent design philosophy and quality, Goldmedal electrical accessories are the ideal choice for modern day homes and offices. - 3 core , 5 mtrs. we are leading electrical goods manufacturer based in mumbai we make spike guards and flex boxes.